On a slightly overcast day in late August, nine Canadian Forces Snowbirds pilots manoeuvred their CT-114 Tutor jets above the white, billowy clouds that hung over Lake Erie and flew along Canada’s border with the United States. Six F/A-18 Hornets from the U.S. Navy Blue Angels demonstration team and six F-16s from the U.S. Air Force Thunderbirds flew behind them, then moved carefully together into an historic 21-ship formation as a photo ship zipped up and down at a distance. This was the first time the three teams had ever flown together in formation, and the significance of the feat weighed on the mind of Capt Blake “Naughty” McNaughton, also known as Snowbird 10. “We constantly work with our American friends and allies,” said McNaughton, who helped coordinate the shoot along with Lt Cmdr Tyler “Feed” Davies (Blue Angel No. 5) and Maj Eric “Miami” Gorney (Thunderbird No. 7). 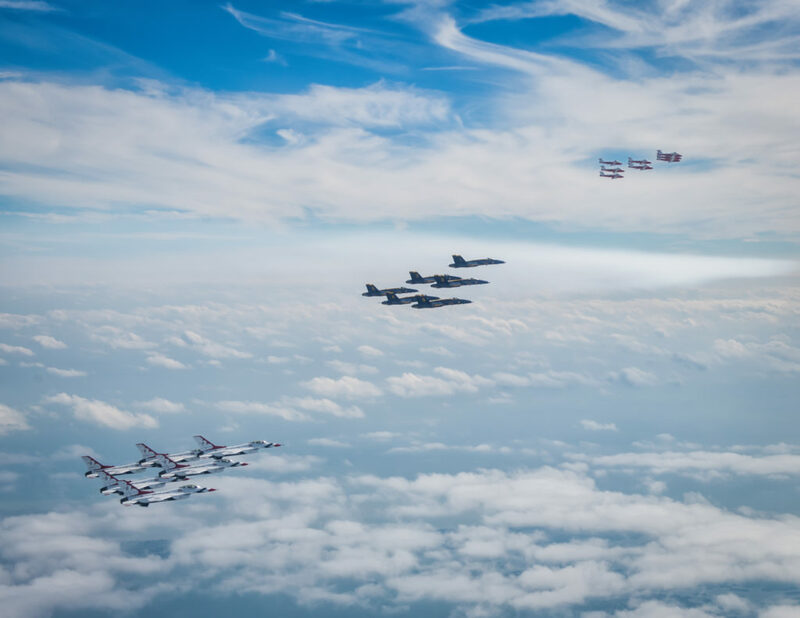 “So it was a fitting tribute to put those three air demonstration teams together, but also to fly them over the U.S.-Canada border at a time when things are rockier than normal. It took more than nine months to coordinate the historic shoot, after McNaughton and Davies hatched the idea at the 2017 International Council of Air Shows (ICAS) annual conference in Las Vegas. 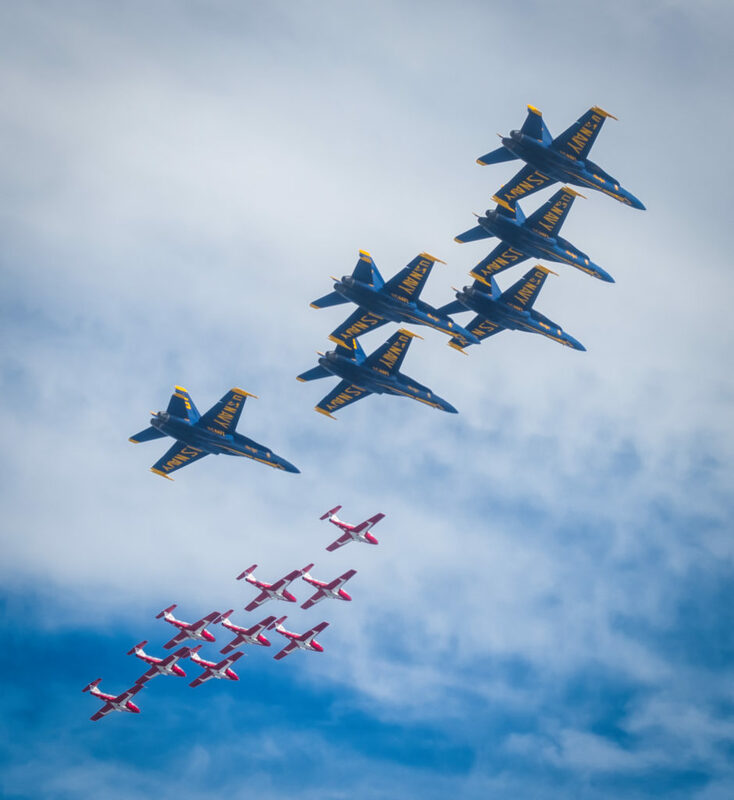 Performance schedules for all three teams were revealed at ICAS, and McNaughton realized the Blue Angels would be in Cleveland over Labour Day weekend when the Snowbirds and Thunderbirds would be in Toronto for the Canadian International Airshow. “It is rare for all three teams to be in such close proximity to each other,” said McNaughton. McNaughton presented the idea at an informal meeting of the Snowbirds, Blue Angels and Thunderbirds later in the ICAS conference. He remembers several sceptical looks as he scanned the room. “People didn’t think we’d be able to pull it off,” he said. “With big ideas you never know what unexpected hurdles you’ll have to overcome …. But we decided to try for it anyway. The idea of conducting a photo shoot along the U.S.-Canadian border seemed perfect, almost poetic, and the low level of air traffic over Lake Erie made it an appealing choice. They sanitized the airspace with help from the Erie air traffic control tower in Pennsylvania, which also provided air traffic control during the flight. Every possible contingency had to be planned for: VFR conditions, IFR conditions, alternate locations if the weather was bad. A detailed communications plan was also required, taking into account all three teams used different kinds of radio procedures. How would they interact with air traffic control? How would they maintain an inter-flight frequency? Ultimately, how would they move safely into formation and how would they break safely away? 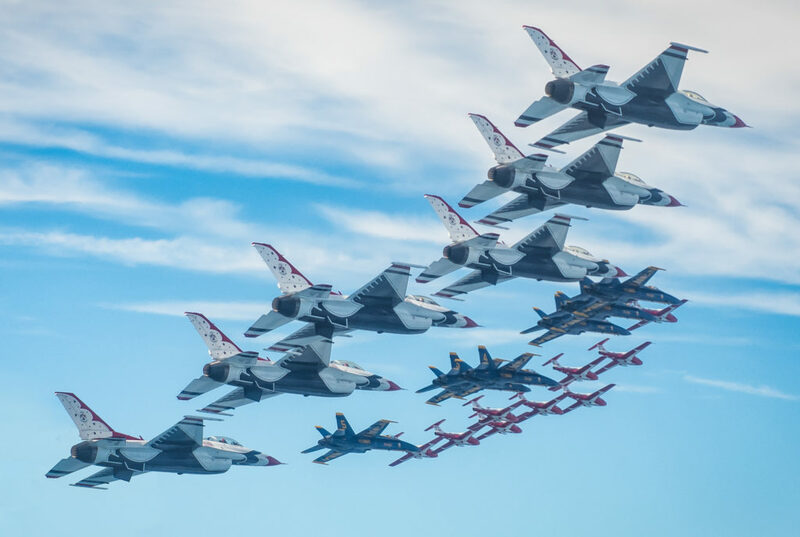 The Snowbirds would arrive at 7,000 feet, the Blue Angels at 5,000 feet and the Thunderbirds at 3,000 feet, and visually confirm each other’s location. “Obviously the F-18 and the F-16 have radar, so they can search for us or each other, but the [Tutors] don’t,” said McNaughton. “So that’s all part of how we made this happen. “We built a racetrack-type lane. Everyone had a lane they had to stay in, so that no one flew through anyone else’s jet wash.
“And then of course we had to figure out the photo stuff,” said McNaughton. They brought in Gorney and developed a plan through much of the spring and early summer. “As we saw each other at different shows … we’d sit down and we’d kind of hash out the latest iteration of the plan,” said McNaughton. Royal Canadian Air Force (RCAF) headquarters, U.S. Navy headquarters and U.S. Air Force headquarters all signed off on the plan, and after a final teleconference briefing they pulled it off. At the recommendation of the Blue Angels, the three teams recruited Texas-based aviation photographer Glenn Watson for the shoot. Watson is a commercial pilot with experience in formation flying, but he had never sat–much less, flown–in the back seat of an F/A-18 Hornet, as he did on this assignment. “Photographically I thought it was pretty exciting,” he said. “But even more than that was just the fact that I was going to be riding in the Hornet … I was super-excited, a little nervous, and trying to be reserved about it in case it didn’t come through. Watson describes himself as a life-long Blue Angels “fanboy,” and this was a dream assignment. But he worried about how to get the shots he wanted. His biggest concern was how the sun would reflect off the Hornet’s canopy, and how he would manoeuvre the camera into position. “You’re strapped in in about 10 different places, and you just can’t move,” said Watson, who used a Nikon D810 with a 24-to-70 millimetre lens throughout. To minimize reflections, Watson wore dark clothing and brought a piece of black foam–roughly two feet by one foot–with a hole in it, sticking his camera lens through the hole. Manoeuvrability remained a concern, and it was never fully resolved. “Due to the spacing of the formations, the photos from my left viewpoint visually brought the jets closer together in the frame, so it was a better position to shoot from photographically,” he said. “This was lucky because that turned out to be the most usable shots due to the physical limitations of shooting in the Hornet. “If you notice in the set of photos, probably almost all of them were taken–from my perspective–looking to my left, up the formation. “There’s hardly any photos on the right side of the jet, because I could not see … I could hold the camera that way, but I could not move my body forward, or to the side, enough to look through the viewfinder to frame a shot. Still, he remembers this as the best day of his life. “Photographically it was an amazing experience, and there’s some really historic photos that have never happened,” he said. The photos turned out well, and they quickly went viral, with effusive comments from viewers who found them online. One fan went as far as to say the images made his heart skip a beat. All the parties involved with the shoot seemed to be happy. “The most magical part of these photos was the fact that they had a huge impact,” said McNaughton. 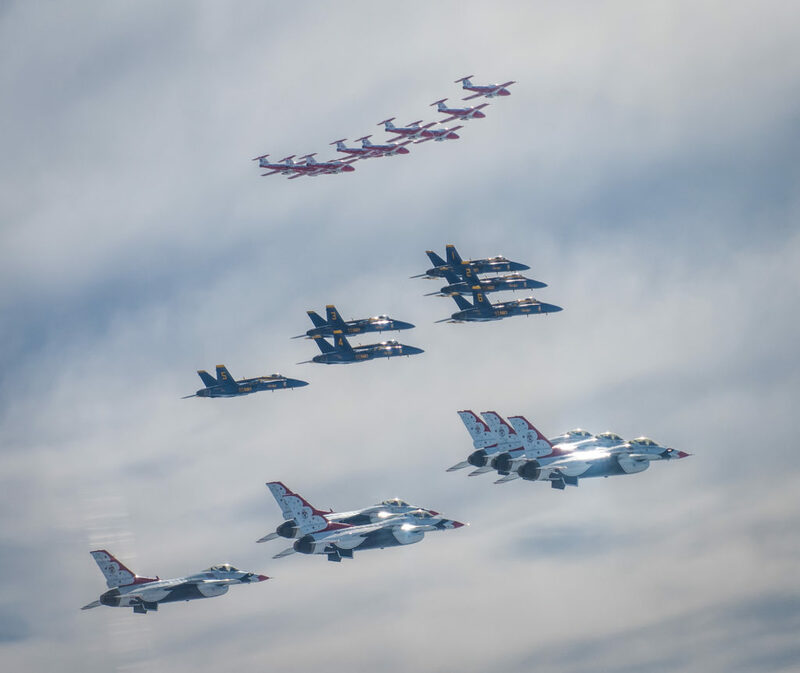 “It was an epic moment for the Snowbirds to participate in such a significant mission with our friends the Blue Angels and Thunderbirds,” added Maj Denis Bandet, Team Lead for the Snowbirds. For his part, Watson is unsure he’ll ever have a more rewarding experience. “I’ve done a number of shoots where I thought, ‘This is it. This is the best shoot I’m ever–there’s no way to top this,’ ” he said. Many of the Snowbirds, Blue Angels and Thunderbirds were inspired to become military pilots after seeing demonstration teams perform. There’s a measure of pride in knowing they may inspire another generation of pilots and maintainers to follow in their footsteps. McNaughton noted about 200 maintainers helped keep the Snowbirds, Blue Angels and Thunderbirds in the air over this past airshow season. “It’s very humbling when someone comes up and says that you inspire them to change their lives in a better way,” he said. The photos are brilliant for this outstanding collaborative event. Its also reassuring to hear that our respective militaries respect each other and communicate above the political arena. As a lifelong Snowbirds fangirl myself, and a newly born Blue Angels fan after their appearance in Abbotsford this summer, I can tell you that as an amateur photographer, I can fully imagine how that would be a dream shoot for you. It would be for me. So historic. And I’ve heard the Thunderbirds are due to appear in Abby next year. So excited to surely become their fan as well! WOW, what a great and history making project. I think it’s a magnificent accomplishment. There should also be a “shout out” to the brass who allowed/ supported it happening. 3 groups of superb professionals having a chance to be part of something that was just for them (for a change); I feel enormous gratitude for their service…and that they chose to share this with us. But I still wish “Naughty” could have been off to the side in Snowbird 10 as well! You can never have everything.